After his devastating battle with Professor Zoom and the Zero Hour event, Wally West must get his life back on track with the help of Nightwing and Starfire, only to be charged with criminal negligence after thwarting Heatwave's Christmas crime spree. And racing to Keystone City straight from the future, it's Impulse, the latest member of The Flash's super-speed family! 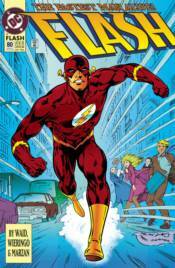 Collects THE FLASH #80-94.